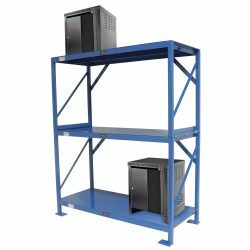 BHS Multi-Tier Charger Stands provide a safe, convenient location for storing lift truck battery chargers. Trust the heavy-duty, rugged construction of BHS shelving to protect your valuable resources. Models of the Multi-Tier Charger Stand come with two to four high-capacity shelves. Each shelf can hold up to 800 pounds while charger-anchoring slots ensure that chargers stay securely in place, even when subjected to heavy vibrations. Shelf widths are available from 36 to 84 inches (36 to 72 inches only in four-tiered units). Because BHS manufactures all equipment in their 128,000-square-foot, state-of-the-art facility, our engineers can produce custom charger stands upon request. BHS also offers a variety of other charger mounting stands and brackets as well as cable management accessories designed for use with charger stands to properly route charger cables. Invest in BHS charger stands to store and protect your industrial battery equipment. Call 1.800.BHS.9500 to speak to our sales team or to find a local dealer.